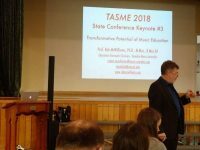 ASME Tas holds a State Conference annually. 2019 TASME State Conference is soon approaching! Presentations, Workshops, Performances, Keynotes and much, much more! 2011 Keynote: Dr Bill Baker. Venue: Scotch Oakburn College. 2009 NATIONAL CONFERENCE. Keynotes: Professor Jackie Wiggins; Professor Margaret Barrett; Professor Craig Kirkhoff; Professor Susan Hallam. National Conference Musical Understanding. Venue: Hotel Grand Chancellor, Launceston. 2008 Keynote: Mandy Stefanakis. Venue: University of Tasmania, Faculty of Education. Launceston. 2007 Keynote: Mary Brake. Venue: University of Tasmania, Faculty of Education. Launceston.